Imagine if you were killed for eating your standard diet? That’s what’s happening to sea lions living below the Bonneville Dam in waters between Oregon and Washington. They are being branded and killed by wildlife officials for eating a negligible number of salmon and steelhead. But the decline in salmon and steelhead numbers is not caused by the sea lions—it’s caused by humans. The sea lions are the ones who pay the price. In less than one week, inexcusable negligence and lack of oversight by the Oregon Dept. 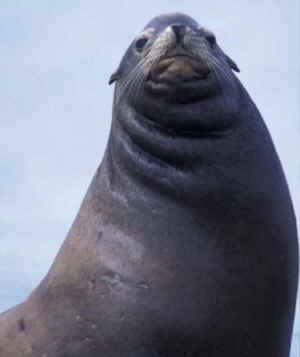 of Fish and Wildlife (ODFW) has resulted in the brutal deaths of three sea lions. The first of last week’s deaths occurred on May 1 when two sea lions were crushed to death after an ODFW trap “malfunctioned.” Nine sea lions “accidentally” became imprisoned in one trap at some point during the night and by morning two of them were dead. The deaths this week are just the most recent instances. This was the second such reported instance of “malfunctioning” trap doors slamming shut, leaving the animals imprisoned to suffer slow and torturous deaths. In 2008 an unattended trap malfunctioned and six sea lions became trapped in a cage where they died from prolonged exposure to extreme summer heat. At that time, ODFW claimed they implemented “new protocols” to prevent unattended traps from closing, including magnetic locks requiring a code to hold the doors open. We can see how well that worked. The second death in the last week happened on May 5, in what ODFW calls a “freak accident”–a stellar sea lion drowned after becoming entangled in cables at the Bonneville Dam’s trap site. This death occurred while trapping was suspended, pending consultation with NOAA (National Oceanic National Oceanic and Atmospheric Administration) and the project’s Institutionalized Animal Care and Use Committee regarding the crushing deaths just four days prior. So even with traps shut down, the program manages to kill and abuse marine mammals! Please immediately call/email the wildlife officials listed below and let them know these incidents are not accidents and cannot be continually attributed to equipment malfunction. Ask them to shut down this project immediately because there is a clear history of negligence and lack of oversight. It wouldn’t hurt to remind them that the real cause for the decline in salmon and steelhead is not the insignificant number of fish eaten by sea lions—it’s due to degraded habitat, dams blocking migration routes, and over-fishing.